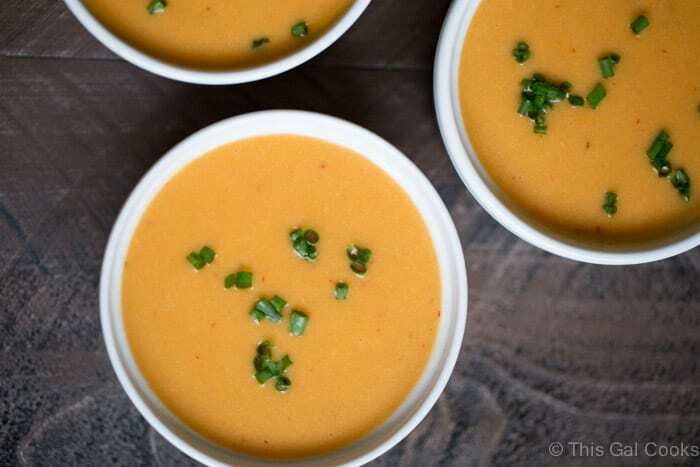 Today we’re diving into a bowl of vegan smoked potato soup. It’s the kind of soup that my vegan and non-vegan friends both can appreciate and love. It’s creamy. It’s silky. It’s smoky. Ultimately it’s full of incredible flavor and substance that satisfies a hungry belly. The secret: Smoked potatoes. They give this soup a smokey flavor that’s typically achieved by adding bacon or ham to soup. A vendor at our local farmers market gave me the idea for this recipe. She told me about a chef who made vegan potato soup with smoked potatoes. Everyone who tried the soup swore up and down there was meat in the soup. Little did they know the chef’s secret ingredient was smoked potatoes. I knew I could make that soup. I asked Ken to smoke some potatoes for me. First, he fired up the Big Green Egg while I prepped the potatoes (wash, scrub, dry). Second, he put the potatoes on the BGE and smoked them for about 1 1/2 hours. Finally, he took them off the BGE, gave them to me and I proceeded to make vegan smoked potato soup. Heat the olive oil in a large pot over medium high heat. Add the leeks, carrots and celery to the pot and cook until tender. Add the chipotle pepper. Mix well. Sprinkle the veggie mixture with the flour and mix well. Add half of the chopped potatoes to the mixture and then add the cashew milk and broth. Mix well. Shut off the heat and allow the mixture to cool slightly. Blend the mixture with an immersion blender or add to a stand up blender to blend. If blending in a stand blender, after blending return the mixture to the pot. Add the remaining potatoes and mix well. Serve in bowls and garnish with chopped fresh chives. To make the smoked potatoes: prepare your smoker. Get the temp up to around 250-350. Wash and scrub your potatoes. Once the smoker is ready, place the potatoes on the smoker and smoke for 1½ to 2 hours. To test if done, poke the potatoes with a toothpick or a knife. If the toothpick or knife is easily inserted and if the potato feels soft, the potato is done cooking. 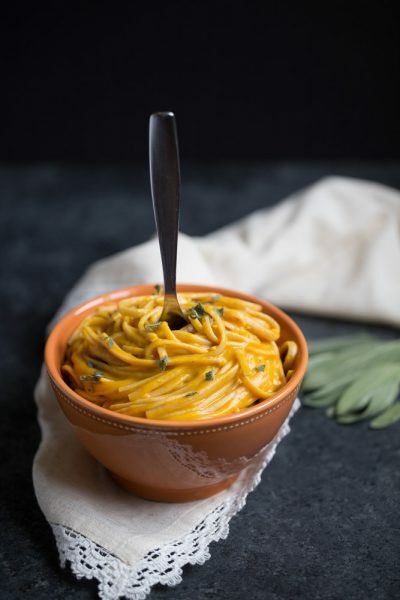 Vegan Pumpkin Cream Sauce – super creamy and flavorful. Toss with pasta, use it as a bread dip or use it as pizza sauce. 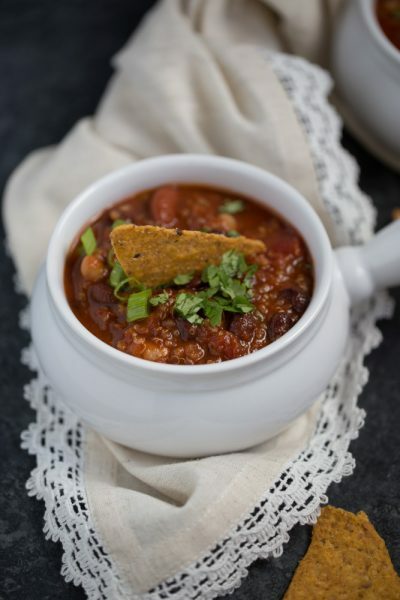 Smoky Vegan Quinoa Chili – thick, hearty, filling and flavorful! 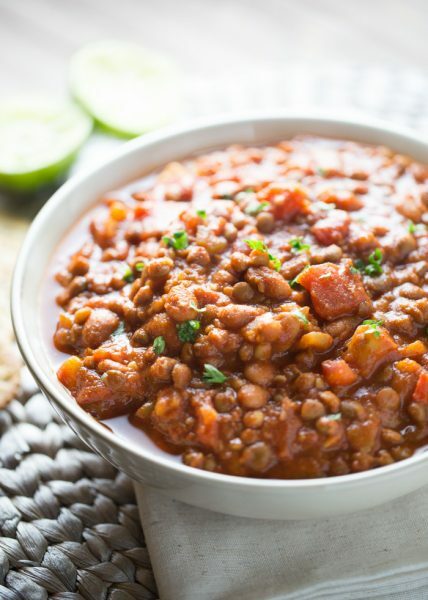 20 Minute Easy Vegan Lentil Chili – another thick and hearty chili recipe. This one only takes 20 minutes to make so it’s perfect for busy weeknights! 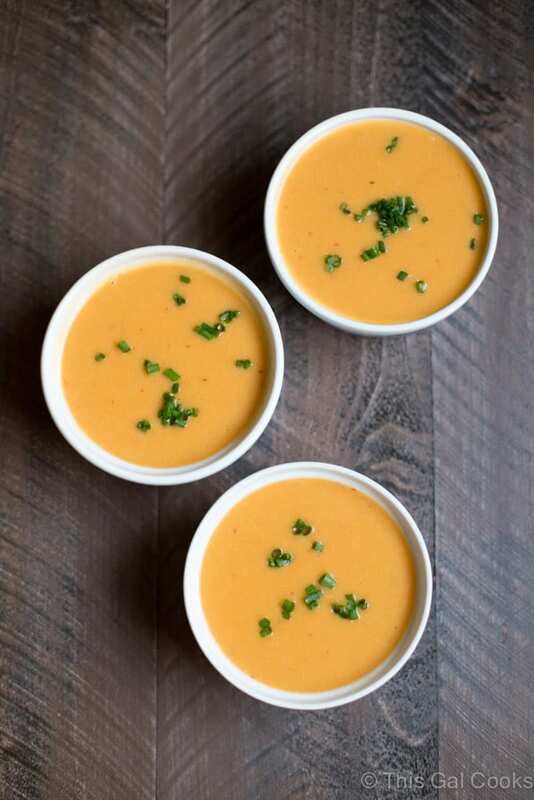 The soup does look so creamy and voluptuous even in the pictures! I really like the recipe! Never seen anything like it! And smoked potatoes? Genius! But I do have a question, Can I use regular milk instead of cashew milk or does it have to be cashew milk? Of course! You can use regular milk in place of the cashew milk. 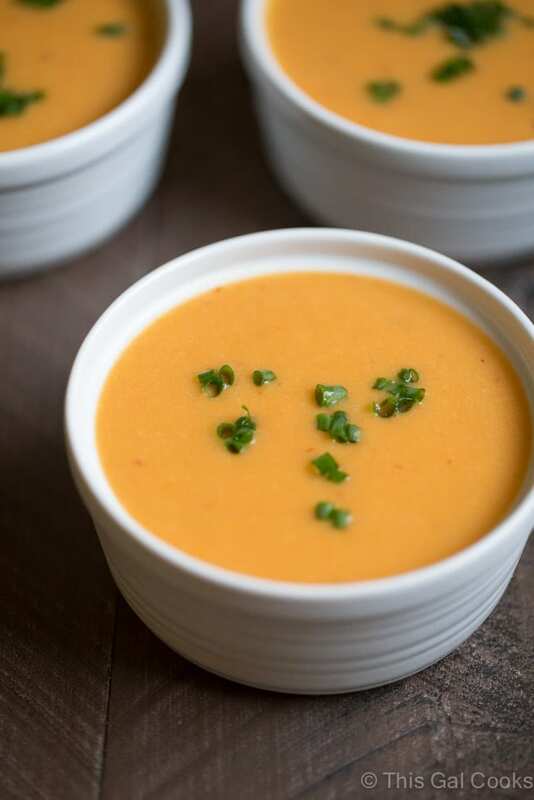 I’m always amazed when a vegan soup looks so delicious and creamy! I think I’m going to try one soon. Thanks for sharing at Fiesta Friday! the idea of smoking the potatoes for this recipe sounds amazing. Love all the ingredients. Stopping in from SITS Sharefest and hope you’re having a great weekend! YES! Smoked potatoes are great even by themselves. We had some with our dinner last night. :) I hope you enjoy the recipe if you give it a try! The recipe never says when to add the vegetable broth. Also if I use liquid smoke how much should I add? Thank you for pointing that out. The recipe has been updated. The broth is added with the cashew milk. I’ve never made this with liquid smoke and rarely use liquid smoke so I cannot say how much to add. Do you have a smoker or a gas/charcoal grill?